Mining Ongopolo mining Engaged in investments in properties, shares and securities, primarily in the fishing sector in Namibia. Fishing Gazania Investment 128 – 51% Catching, processing and marketing of fish products and third party trading with related fish products. Twafika – 24.9% Catching, processing and marketing of fish products and third party trading with related fish products. 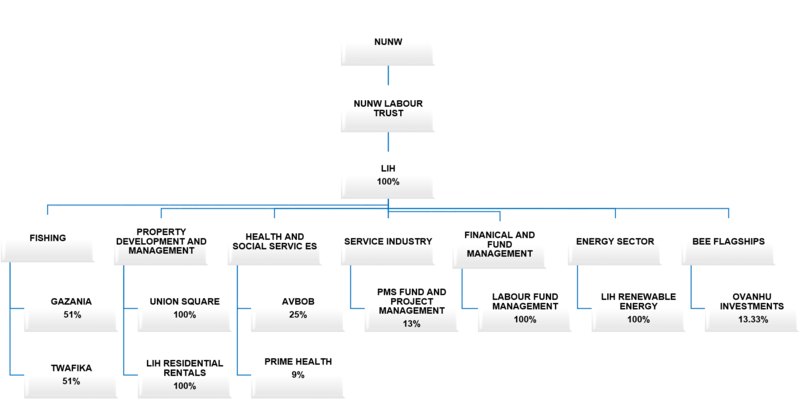 Ovanhu – 13.33% shareholding LIH is a shareholder in Bidvest Namibia through its flagship BEE entity Ovanhu in which it owns 13.33% shareholding. The company was converted to consolidate the Bidvest Group Limited’s operations in Namibia under one centralized entity. Bidvest Namibia has diverse portfolio of investments similar to those of its parent companies namely Bidfish and Bidcom. Ovanhu is a vehicle established in 2010 for the purpose of providing Bidvest Namibia with BEE shareholding exposure. The company was set up for the financing of the BEE shareholding structure, via a loan from Bidvest South Africa. Property development and Management NUNW Property Development- Union Square Project in the pipeline. Apply to be a tenant by following the link on out page. Service Industry Walvis bay- Naraville Flats Endombo Investment Holdings – 9% Shareholding Administrator of government medical aid. Avbob – 25% shareholding Works in the Funeral Services Focusing on the provision of funeral services, manufacture of coffins, sale of coffins, wreaths and coffin fittings.